For the past two years, investigators around the world have been gradually closing in on Deutsche Bank over its key role in a massive Russian money laundering scheme that very much appeared to have served as the vehicle for how the Kremlin has been keeping Donald Trump afloat financially. Deutsche Bank has been cooperating incrementally, but apparently insufficiently, as evidenced by the German government’s recent raid on its headquarters. Now Deutsche is finally selling Trump out. For several years, even as Donald Trump repeatedly went broke, and banks around the world were increasingly unwilling to lend him more money, Deutsche Bank in Germany was singularly eager to keep stuffing large sums of money into Trump’s wallet. Combine this with Deutsche Bank’s 2017 bust for laundering Russian money into the hands of clients in places like Trump’s hometown of New York City, and it’s not difficult to parse that the “loans” were merely a front for the Kremlin funneling money to Trump. The question now is whether Deutsche Bank has sold Donald Trump out voluntarily. 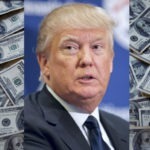 Yesterday the New York Times reported that during the 2016 election cycle, Trump tried to borrow even more money from Deutsche Bank, but it rejected the request, for fear that Trump would become president and then use the office to find a way to not have to pay the loan back. Here’s the thing. There are only two possible sources for this story. One is Deutsche Bank itself. The other potential source would be criminal investigators who have seized the bank’s records. Considering that this story makes Deutsche Bank look good, it’s fair to conclude that the bank itself is the most likely source of the story. That doesn’t mean the story is inaccurate. But it does raise some odd questions. For instance, back in early 2016, when the polls suggested Trump had little chance of wining the election, how could Deutsche have expected Trump to win? At that time, only the Trump campaign and the Kremlin could have known that the election was going to be rigged in Trump’s favor. Also, why would Deutsche Bank suddenly become skittish about the prospect of Donald Trump not repaying the additional loan, considering that these “loans” weren’t meant to be paid back anyway? Is Deutsche trying to tell us that it had broken off its longstanding criminal relationship with the Kremlin by that time? There’s a lot to chew on here. But one way or the other, Deutsche has finally sold Trump out, if only perhaps as a last ditch effort at saving what little is left of its own reputation.